Full Peruvian - FUTURITY HERD SIRE NOMINEE, FULL ACCOYO DURAZNO (URIBE) son...this proven herd sire has already produced MULTIPLE Color Champions and blue ribbon winners. 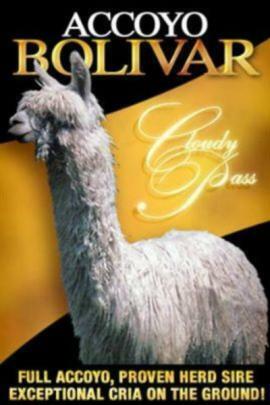 Accoyo Bolivar has the tall/stretchy look the judges comment on in the show ring. He exudes luster and lock and absolutely perfect conformation...and he comes from a full Accoyo DARK FAWN sire that could add Accoyo color to your herd. The "pure suri" URIBE/DURAZNO, Accoyo Bolivar's sire, sired 138 offspring...all suris...and many of them colored. Limited breedings available. Katia is a fawn, full Accoyo female...a wonderful surprise. She has fawn around her eyes and even her eyelashes are fawn. She has that typey head and fabulous conformation...a strong cria! Black around her nose. 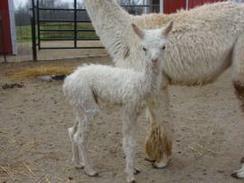 We are deeply saddened that Katia passed away on 9/11/12 giving birth to a beautiful female cria. The cria also passed away. 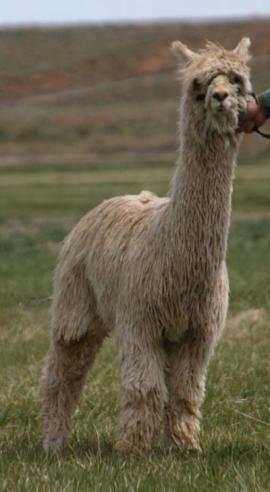 Full Accoyo Aliena comes from a fawn full Accoyo Color Champion Dam and has full Accoyo, nationally known sires in her pedigree including RAMILO, MONTOYO, BARON, URIBE and BOLIVAR. She has a beard forming and fiber between her toes! Accoyo Aliena will definitely be in our 2010 show string!